Another rainy and dreary day out today. Things have settled down somewhat in the house today, a lot calmer. Had a Poached Egg on a slice of Klosterman Wheat Bread for my Breakfast. Mom went o Breakfast with some members of her Church and I was going to prepare Dad something but as usual he wanted McDonald’s! Puttered around the house doing some odds and ends for the day. Spammed it for dinner tonight! 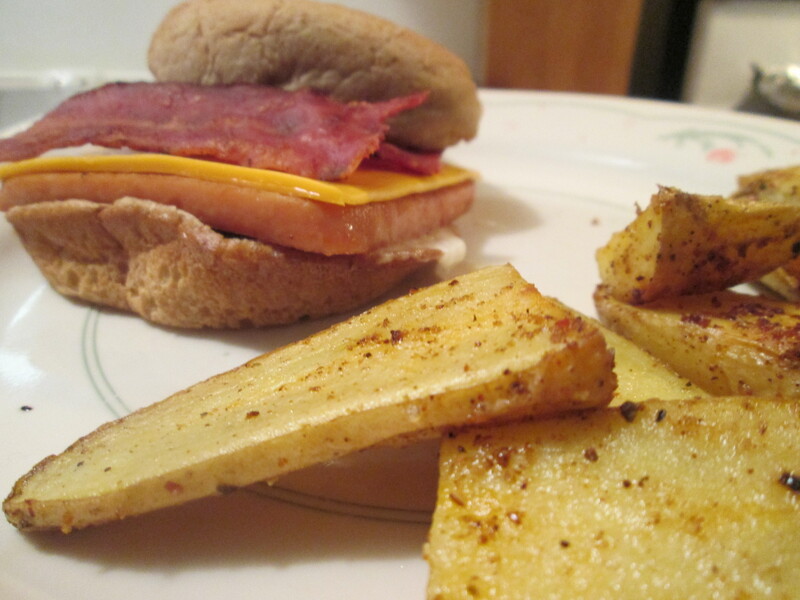 I prepared a Bacon Cheese Turkey Spamburger Hamburger w/ Baked Fingerling Potato Wedges. Forgive me, for I have Spammed! I wanted something a little different for dinner tonight so I dug around the pantry and found a can of Turkey Spam. Then went to the Spam website, clicked on to recipes and found this one – Bacon Cheese Spamburger Hamburger. I made mine with Turkey Spam, less 100 fewer calories and 5 less grams of fat per serving than normal Spam! Not a bad trade-off! 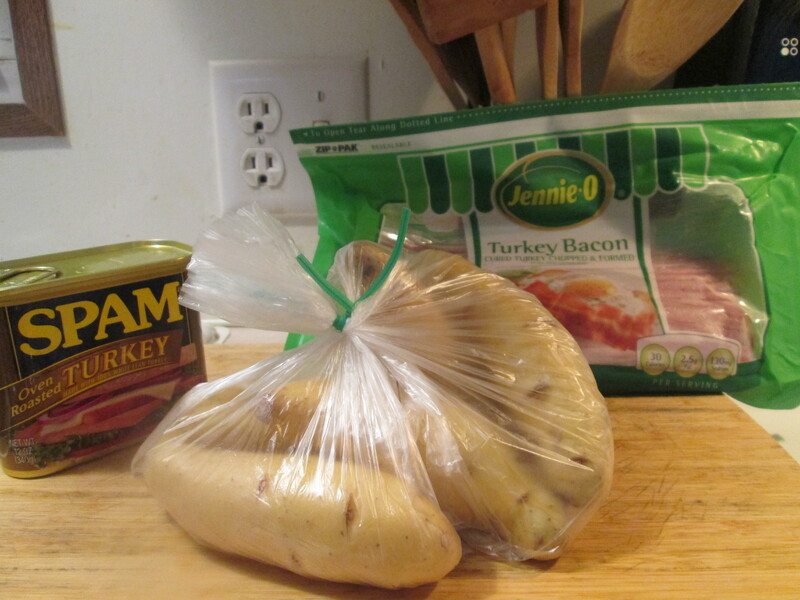 So to make this Turkey Spamburger I’ll need; 1 Can Oven Roasted Turkey Spam, 1 Slice of Bordon Sharp Cheddar Sliced Cheese, Jennie – O Turkey Bacon (2 Slices), Kraft Reduced Fat Mayo w/ Olive Oil, and Kroger Lite Wheat Hamburger Buns. To prepare it; In medium skillet (Sprayed with Pam Cooking Spray), cook the Turkey Spam over medium heat, turning once, 3 to 5 minutes or until lightly browned. How easy is that! What an excellent Burger. The Oven Roasted Turkey Spam has great flavor and the trimmings and you have that excellent Burger. There’s a Hawaiian Spam Burger I’m going to give a try here soon also. For a side, I had bought some Fingerling Potatoes at Jungle Jim’s yesterday. Preheated the oven at 400 degrees. 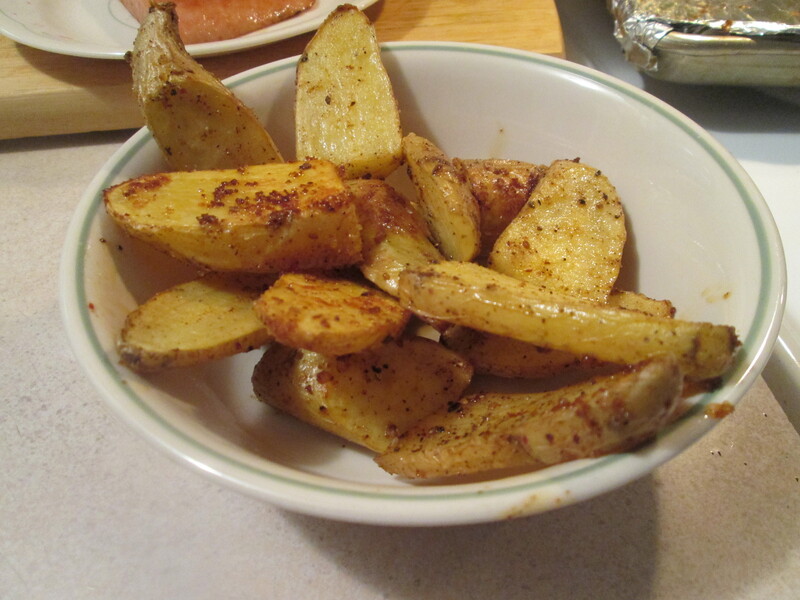 So I took a few of them and sliced them into wedges. Put them in a bowl, added some Extra Virgin Olive Oil to them (just enough for a light coat). Then seasoned them with McCormick Grinder Sea Salt and Black Peppercorn, Ground Garlic Powder, and Chili Powder. Sprayed a small baking pan with Pam Spray and added the Wedges. Baked them until fork tender, about 18 minutes. Served them with a side of Hunt’s Ketchup. I love Fingerling Potatoes but we can only find them at Jungle Jim’s International Market, Why? Anyway for dessert later a Jello Sugar Free Dark Chocolate Pudding. It’s time to envision yourself making a better kind of bacon cheeseburger. Imagine burgers buns slathered in mayo and topped with cheese, bacon and glorious SPAM® Classic. 1 – In large skillet, cook SPAM® Classic over medium heat, turning once, 3 to 5 minutes or until lightly browned. 2 – Spread mayonnaise on cut sides of buns. Layer lettuce, tomatoes, SPAM®, cheese and bacon on bottom halves of buns. Cover with top halves of buns. 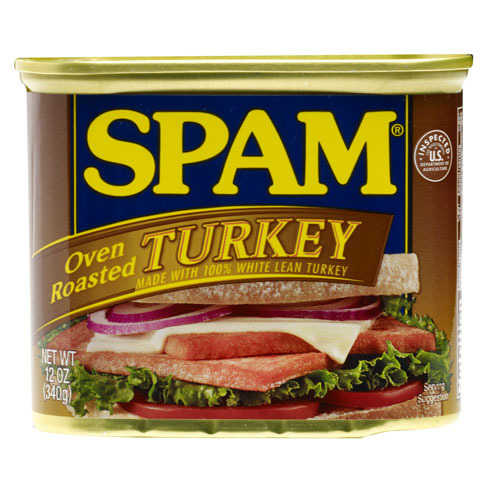 This SPAM® variety is made from 100% white, lean turkey. Some folks wonder why we didn’t call it SPURKEY. But if we had, it wouldn’t be a proper member of the SPAM® family of products. And like all SPAM® varieties, this one’s full of yumminess. Swap it into your same old sandwich. Break The Monotony™. Made with 100% White, Lean Turkey Ingredients: White Turkey, Turkey Broth, Salt, Modified Potato Starch, Sugar, Dextrose, Sodium Nitrite. Good morning from the chilly confines we cal West Chester, Ohio! Only 39 degrees to start out this morning. Made a hot and delicious Breakfast to heat it up a bit. I prepared a Turkey Spam, Hash Browns, and Egg Skillet. Tried Spam for the first time a few months ago and I’ve been having it regular ever since. Started with the Spam Light and now I use the Turkey Spam, it has fewer calories and carbs than any of the other varieties. Using a small skillet I heated it up on medium heat, adding 1 tablespoon of Extra Virgin Olive Oil to the pan. After it was heated I added my Hash Browns, Simply Potatoes Brand, and seasoned them with Sea Salt, Pepper, and Dried Dill. Flipped them over after about 6 minutes, reseasoned and added my Turkey Spam. I had cut off one serving of the Spam and diced it before adding it to the pan. As that was finishing up in another small skillet I fried one Medium size Egg, Sunny Side Up that I seasoned with Sea Salt and Pepper. 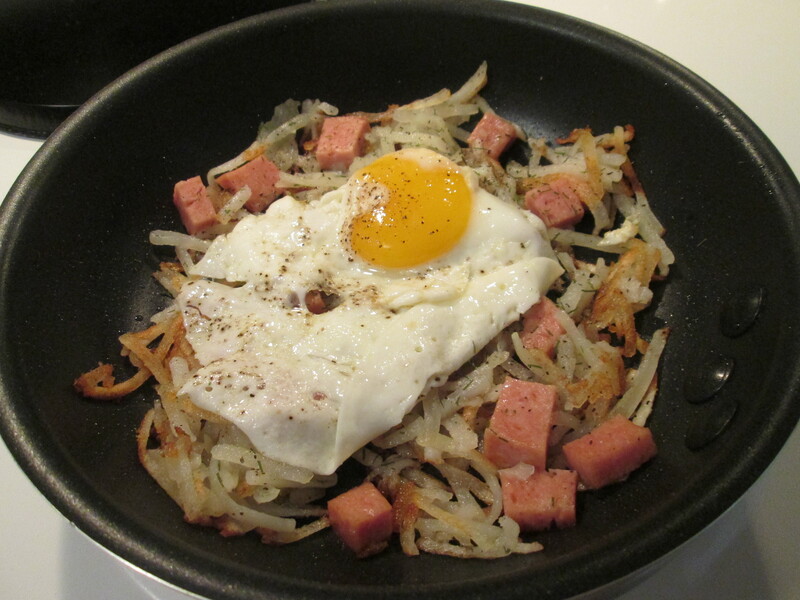 As the Egg was almost done I added into the other skillet on top of the Hash Browns and Spam. Served it with a hot cup of brewed Bigelow Decaf Green Tea and my Sunday Morning Papers and enjoyed Breakfast! I tried Spam for the first time this morning! I know your probably thinking, “Wow he must have led a sheltered life”. You have to know I was a very, and I mean very picky eater up until about 5 or 6 years ago. I was so picky that when I was young my Mom took me to the doctor because I would hardly eat or try anything, besides Hot Dogs of course! The doctor told her then not to worry he’d never seen a growing boy who starved himself. Then I was diagnosed with Diabetes 2. When I found that out I started eating healthier and trying foods I would have never ate, and now Spam being one of them this morning. I used Spam Light, which has less Fat, less Sodium, and fewer Calories than normal Spam. I see on the Spam web site that there is a Spam Turkey. I’ll have to see if I can find that one and try that one also. 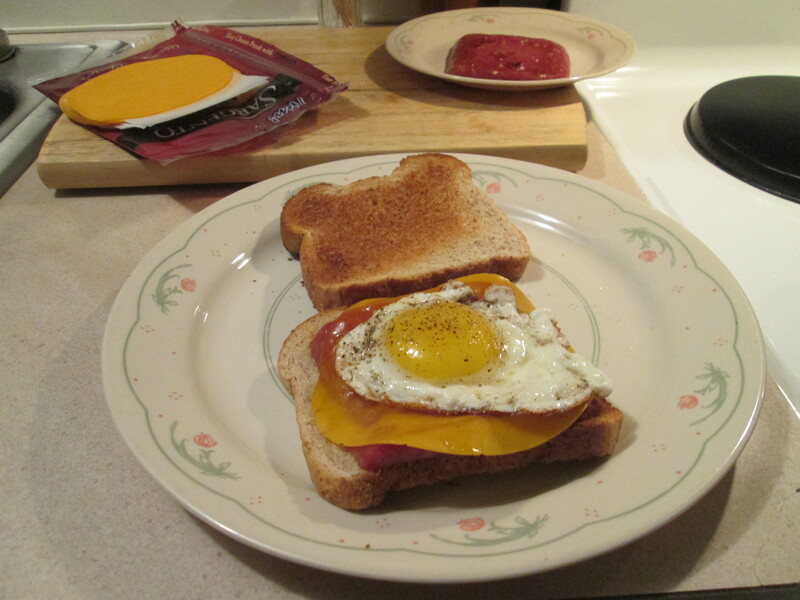 For Breakfast I prepared an Egg, Cheese, and Fried Spam Sandwich. I fried the egg Sunnyside Up and used a slice of Sargento Ultra Thin Colby Longhorn Cheese. Then for the Spam I sliced it and pan fried it in a 1/2 tablespoon of Extra Virgin Olive Oil. i fried it till both sides had browned, turning it over one time. It fried up very easy to a perfect golden brown. From there I made my sandwich, using Klosterman Wheat Bread. I toasted the bread and topped it with Spam, Cheese and cooked Egg. Makes one delicious Breakfast sandwich! I am now a Spam convert! Looking forward to trying the different Spam and Spam recipes! And yes I have Spammed! Heavy on the flavor, light on the other stuff. This variety offers the sumptuousness of SPAM® Classic with 33% fewer calories, 50% less fat and 25% less sodium, which means you can enjoy the taste you love more often. 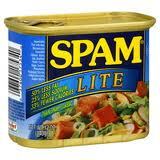 It’s the perfect SPAM® variety for swimsuit season. Pork with Ham, Mechanically Separated Chicken, Water, Salt, Modified Potato Starch, Sugar, Sodium Phosphates, Potassium Chloride, Sodium Ascorbate, Sodium Nitrite. Spam (its name a portmanteau of the words “Spiced” and “Ham”) is a canned precooked meat product made by the Hormel Foods Corporation, first introduced in 1937. The labeled ingredients in the classic variety of Spam are chopped pork shoulder meat, with ham meat added, salt, water, modified potato starch as a binder, and sodium nitrite as a preservative. 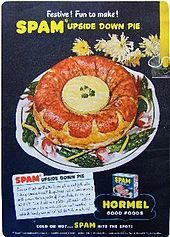 Spam’s gelatinous glaze, or aspic, forms from the cooling of meat stock. The product has become part of many jokes and urban legends about mystery meat, which has made it part of pop culture and folklore. Through a Monty Python sketch, in which Spam is portrayed as ubiquitous and inescapable, its name has come to be given to electronic spam, including spam email. In 2007, the seven billionth can of Spam was sold. On average, 3.8 cans are consumed every second in the United States. Spam is typically sold in cans with a net weight of 340 grams (12 ounces). A 100-gram (3.5-ounce) serving of original Spam provides 1,300kJ (310 Calories or kilocalories), 13 grams of protein (26% DV), 3 grams of carbohydrates (1% DV), 27 grams of total fat (41% DV), including 10 grams of saturated fat (49% DV). The cholesterol content of Spam is 70 milligrams (23% DV). A serving also contains 57% of the recommended daily intake of sodium (1369 milligrams). Spam provides the following vitamins and minerals: 0% vitamin A, 1% vitamin C , 1% calcium, 5% iron, 3% magnesium, 9% potassium, 12% zinc, and 5% copper. Spam advertisement on back cover of Time magazine on May 14, 1945. In addition to the variety of flavors, Spam is sold in tins smaller than the twelve-ounce standard size. Spam Singles are also available, which are single sandwich-sized slices of Spam Classic or Lite, sealed in retort pouches. As of 2003, Spam is sold in 41 countries worldwide, sold on six continents and trademarked in over 100 different countries.In the United States in the aftermath of World War II, a troupe of ex-G.I. women was assembled by Hormel Foods to promote Spam from coast to coast. The group was known as the Hormel Girls and associated the food with being patriotic. In 1948, two years after the group’s conception, the troupe had grown to 60 women with 16 forming an orchestra. The show went on to become a radio program where the main selling point was Spam. The Hormel Girls were disbanded in 1953. Spam is still quite popular in the United States, but is sometimes associated with economic hardship because of its relatively low cost. The residents of the state of Hawaii and the territories of Guam and the Commonwealth of the Northern Mariana Islands (CNMI) consume the most Spam per capita in the United States. 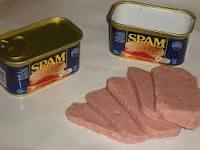 On average, each person on Guam consumes 16 tins of Spam each year and the numbers at least equal this in the CNMI. Guam, Hawaii, and Saipan, the CNMI’s principal island, have the only McDonald’s restaurants that feature Spam on the menu. In Hawaii, Burger King began serving Spam in 2007 on its menu to compete with the local McDonald’s chains. In Hawaii, Spam is so popular it is sometimes referred to as “The Hawaiian Steak”. One popular Spam dish in Hawaii is Spam musubi, where cooked Spam is combined with rice and nori seaweed and classified as onigiri. Spam was introduced into the aforementioned areas, in addition to other islands in the Pacific such as Okinawa and the Philippine Islands, during the U.S. military occupation after World War II. Since fresh meat was difficult to get to the soldiers on the front, World War II saw the largest use of Spam. G.I. started eating Spam for breakfast, lunch, and dinner. (Some soldiers referred to Spam as “ham that didn’t pass its physical” and “meatloaf without basic training”.) Army soldiers commonly refer to SPAM as Special Army Meat due to its introduction during the war. Surpluses of Spam from the soldiers’ supplies made their way into native diets. Consequently, Spam is a unique part of the history and effects of U.S. influence in the Pacific. The perception of Spam in Hawaii is very different from that on the mainland. Despite the large number of mainlanders who consume Spam, and the various recipes that have been made from it, Spam, along with most canned food, is often stigmatized on the mainland as “poor people food”. In Hawaii, similar canned meat products such as Treet are considered cheaper versions of canned meat than Spam. This is a result of Spam having the initial market share and its name sounding more convincing to consumers. In these locales, varieties of Spam unavailable in other markets are sold. These include Honey Spam, Spam with Bacon, and Hot and Spicy Spam. In the CNMI, lawyers from Hormel have threatened legal action against the local press for running articles decrying the ill-effects of high Spam consumption on the health of the local population. Spam that is sold in North America, South America, and Australia is produced in Austin, Minnesota, (also known as Spam Town USA) and in Fremont, Nebraska. Austin, Minnesota has a restaurant with a menu devoted exclusively to Spam, called “Johnny’s SPAMarama Menu”. In 1992, SPAM Lite was introduced, and in 2001, SPAM Oven Roasted TURKEY was introduced. Spam is celebrated in a small local festival in Austin, Minnesota, where Hormel corporate headquarters are located. The event, known as Spam Jam, is a carnival-type celebration that coincides with local Fourth of July festivities, featuring parades and fireworks that often relate to the popular luncheon meat. Austin is also home to the Spam Museum, and the plant that produces Spam for most of North America and Europe. In addition to the periodic celebration, there is a national recipe competition where submissions are accepted at the top forty state fairs in the nation. Hawaii also holds an annual version of Spam Jam in Waikiki during the last week of April. The small town of Shady Cove, Oregonis home to the annual Spam Parade and Festival, with the city allocating $1500 for it. The Spam Jam is not to be confused with Spamarama, which is a yearly festival held around April Fool’s Day in Austin, Texas. The theme of Spamarama is gentle parody of Spam, rather than straightforward celebration: the event at the heart of the festival is a Spam cook-off that originated as a challenge to produce an appetizing recipe for the meat. The festival includes light sporting activities and musical acts, in addition to the cook-off.